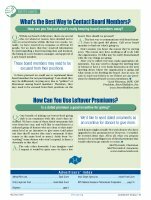 Home > Membership > Nonprofit World > How Can You Use Leftover Premiums? How Can You Use Leftover Premiums? Is a dated premium a good incentive for giving?